I will give step by step instructions, and the complete recipe is at the end. 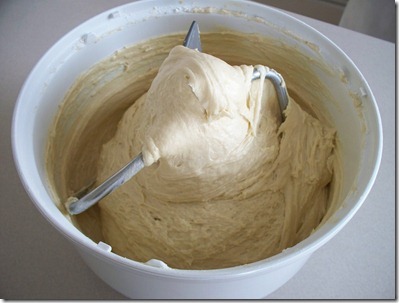 Start by putting warm water, sugar, oil, and yeast in your mixer bowl. Mix a little bit, then let it sit for 15 minutes. Now add salt, eggs, and flour. Put the lid on and mix it for 10 minutes. Turn it off and let it sit for 10 minutes. Oil your cupboard (don’t use flour). 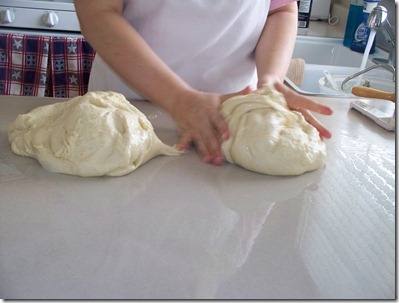 Dump your dough out and divide in half. 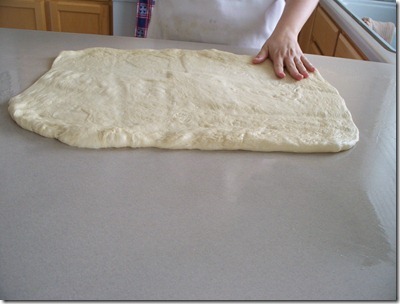 Press your dough into a basic rectangle shape with your hands. When I talked to my mom, she told me she never uses a rolling pin. Just her hands. 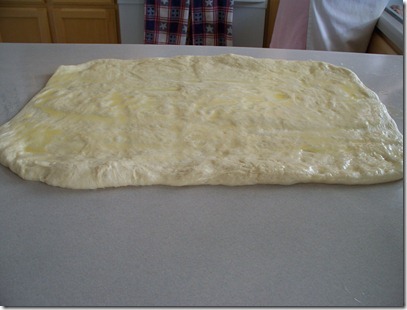 Melt 1/2 cube of butter (or margarine, whatever you have is fine) and pour it onto the dough. Spread it out (I use my hands…much easier and faster). 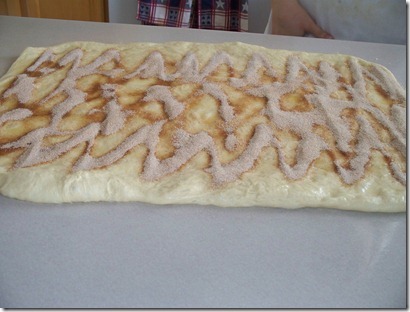 Take your cinnamon-sugar mixture and spread evenly over the dough. Don’t forget your edges! If you want to add raisins, at the beginning, put them in warm water to plump them up. Then sprinkle them on at this point. 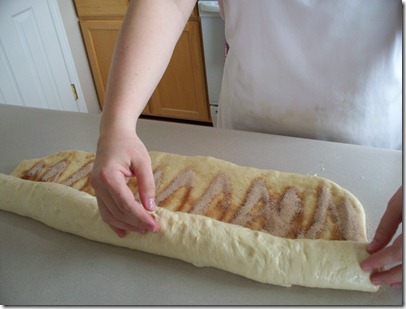 Now you need to roll up your dough. You want it tight, but not too tight. It just takes practice. This roll now needs to be divided into 12 equal size sections. Divide in half, then each section in half. That give you 4. Then cut each of those 2 more times to give you 3 from each. 12 total. Place all 12 on a greased cookie sheet (I also lay a sheet of parchment paper down and then grease it. Much easier cleanup). When you put them down, put the ends facing into the middle. That way you won’t have any dry ends. Repeat with the other half of your dough. You now have 24 rolls. Now you let them rise. It really doesn’t take very long. 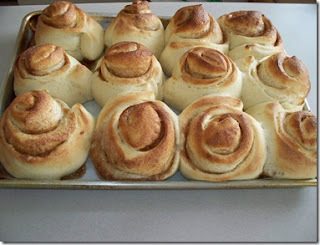 They will raise in the oven some, so don’t let them get too big. This is approximately how big they are when I put them in the oven today. I normally would let them rise a bit longer. I like them big! Bake for 12-14 minutes at 400. They should be a nice golden brown when you take them out. 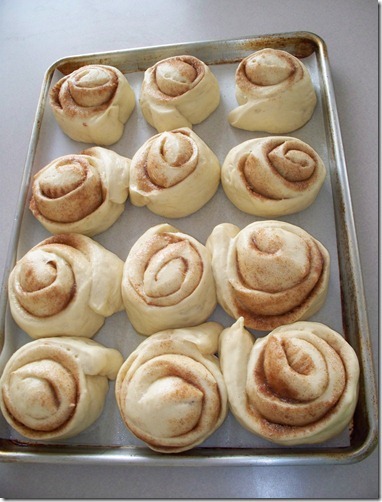 Let them cool, and then it’s time to frost. 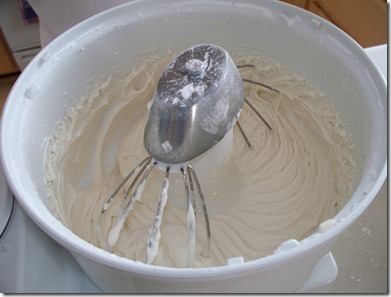 To make your frosting, put your powdered sugar in the bowl, along with butter, salt, and vanilla. SLOWLY add milk until the frosting is the consistency you want. I am still working on this one. I always add just a touch too much, and then it is too runny. But it still tastes good. Now just spread the frosting on using a rubber spatula. 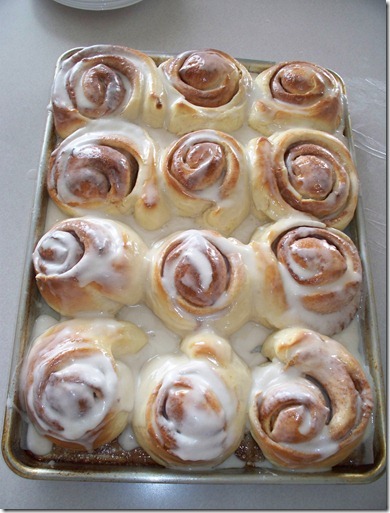 This recipe of frosting will cover both trays of rolls. Be generous. The frosting really makes it perfect! I frosted them too soon today because we really wanted to taste them, so the frosting melted a little bit. But they are so delicious warm that it is worth it! So there you go! Easy cinnamon rolls. We started at 9:30, and by 11:30, everyone was gone. We had made them, baked them, frosted them, and eaten them. 2 hours. It doesn’t get much simpler than that! Mix together for 10 minutes, then sit for 10 minutes. Oil cupboard, dump out dough. Divide in half. Roll one half out into rectangle. 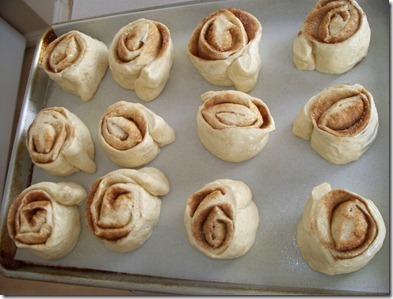 Spread with ¼ c. melted butter and then with cinnamon-sugar mixture. Roll up tight, but not too tight. 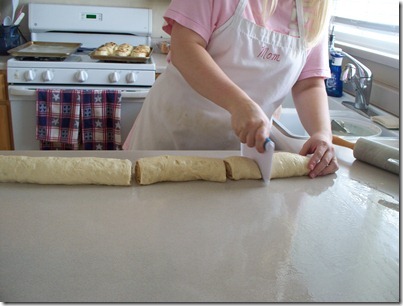 Divide into 12 rolls and place on greased cookie sheet. Repeat with other half of dough. Let rise. Bake for 12-15 minutes at 400.